Pakistan’s government struck a deal on Monday with leaders of a fundamentalist Islamist protest movement, saying that the country’s law minister would step down in return for an end to demonstrations that had brought violent clashes and paralyzed the Pakistani capital for weeks, as the NYT reports. Meanwhile, the White House is calling Pakistan’s release of a U.S.-wanted militant last week a “step in the wrong direction” and says a refusal to rearrest him would damage bilateral ties and Pakistan’s reputation around the world, as the AP reports. Dive Deeper: “U.S. strategy must accept the fact that there is no clear solution to the fact that Pakistan, a supposed ally receiving massive U.S. aid, never stopped from providing a de facto sanctuary to the Taliban, Haqqani network, and key elements of Al Qa'ida central,” from CSIS’s Anthony Cordesman. The Pentagon said on Monday it was reviewing “adjustments” in arms for the Syrian Kurdish forces that have angered Turkey, but it stopped short of halting weapons transfers, suggesting such decisions would be based on battlefield requirements, as Reuters reports. The move could help ease strained tensions between the United States and Turkey, two NATO allies that have been sharply at odds over how best to wage the fight against IS, but may further alienate Syrian Kurds who bore much of the fight against the group, as the Washington Post reports. Dive Deeper: “How to work with the Kurds—and Turkey—in Syria,” from Brookings’ Michael O’ Hanlon. The Trump administration has endorsed the Turnbull government's foreign policy white paper, which tilted more hawkish on China, with a senior U.S. diplomat saying the document outlines "issues of concern" that are shared by the United States and Australia, as the Australian Financial Review reports. Bitcoin soared on Monday toward $10,000 after gaining more than a fifth in value in the past three days. —CSIS's Jon Alterman authored a new commentary, “Benign Neglect,” which appeared in the November edition of Middle East Notes and Comment. A new study from Beyond Parallel indicates an elevated likelihood of North Korean weapons of mass destruction (WMD) activity in the next 14 to 30 days. (Photo credit: Sonny Tumbelaka/AFP/Getty Images.) 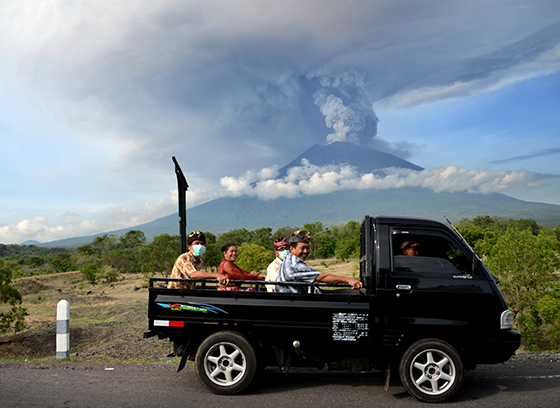 Balinese people ride on an open car past Mount Agung on Indonesia’s resort island of Bali on November 27, 2017. An eruption could be imminent, with the volcano belching huge plumes of smoke, as officials raised the alert to the highest level and increased the exclusion zone. Join CSIS at 9:30 a.m. for the launch of the Global CCS Institute’s annual 2017 Global Status of CCS, a report on carbon capture and storage (CCS) that highlights determining factors for meeting the Paris Agreement's climate targets. At 1:30 p.m., join the CSIS Energy and National Security Program for the report launch of Energy and Development: Providing Access and Growth, a unique survey of energy and economic growth in the developing world. And, at 5:30 p.m., join CSIS’s Smart Women, Smart Power for a discussion with Dr. Kristalina Georgieva, CEO of the World Bank, on developing human capital, women’s economic empowerment, and the importance of educating girls as a means of reducing global poverty. Today, CSIS hosted a discussion on private-sector development in Afghanistan, a crucial topic for U.S engagement in the region. Russian Roulette’s new podcast features a conversation with Alisher Siddique, the head of Radio Free Europe/Radio Liberty’s Uzbek Service, on the recent terror attack in New York City and the changing political and social environment in Uzbekistan. You can listen Apple Podcasts or SoundCloud. George Harrison passed away sixteen years ago this week at the age of 58. It’s hard to believe. His music and influence still seem so present. I didn’t have to do anything other than fire up Netflix to be reminded of the “Quiet One” as the brilliant 2011 Scorsese documentary “George Harrison: Living in the Material World” popped right up in my queue. On a lovely Thanksgiving weekend this couldn’t have been a better 208 minute video to dive into. My favorite part of the film was the discussion of Harrison’s immediate post-Beatles career—especially the recording of his mammoth triple album, “All Things Must Pass” in 1970 and the 1971 “Concert for Bangladesh” in New York. The musicians Harrison assembled to work with him on these two masterpieces include some of rock’s royalty: Eric Clapton and the band which would become Derek and the Dominoes, Leon Russell, Billy Preston and Bob Dylan to name a few. Some of the inspiration grew out of Harrison’s association with Clapton and Delaney and Bonnie—at least the southern rock and soul element of it. Of course “The Concert for Bangladesh” grew out of Harrison’s friendship with Ravi Shankar. This clip from “The Concert for Bangladesh” is a real highlight of Harrison’s career.